Last night my wife and I attended a city council meeting in regards to the homeless in our town. Since I sit on the Feed My Sheep Board (homeless ministry of Glenwood Springs)we decided to go to lend our support and solidarity to those who are considered lesser amongst us such as the homeless. It was an interesting and congenial meeting. I was impressed with our city council’s approach to the complaints that were brought before them about the homeless by certain business owners in our community. In turn I also understood where the business owners were coming from and they too wanted to work towards a solution that didn’t dehumanize the homeless. You see Glenwood Springs is a resort town which relies on tourism for its economy, that’s actually how it is for most mountain towns in Colorado. And obviously the business owners whether hotel owners or shop owners don’t want the people being bothered by the homeless so as to effect their profits (it’s always about money after all which is another issue in and of itself). But there was an underlying issue in the midst of all of these discussions that came up when the Police Chief was asked to give his thoughts on the supposed problems. The Police Chief explained that most of the crimes of the homeless happen amongst themselves, in their culture. Rarely, if ever, is there a call in relation to a homeless person or transient assaulting or doing something offensive to a tourist or local. In other words the crimes committed amongst the homeless were usually committed amongst themselves and those weren’t all that common either. Basically, the Police Chief said without saying that the homeless really aren’t that big of a problem for the police despite what some might think or assume when they see such people. Going further, those who did cause problems were usually just passing through our town and not part of the homeless community of Glenwood Springs. But the Police Chief mentioned that they do receive a good amount of complaints from locals about how the homeless make them feel uncomfortable when they are out and about in the mornings and nights running and working out. Although, there has never been an assault in such cases. And this fact is what I found most interesting. You see the complaints were in regards to a fear that wasn’t necessarily based in fact. The fear was based in something else, assumptions and culture. Hearing some of the complaints I couldn’t help but be a little bit disturbed because they just seemed so petty and sheltered. My wife along with a few others including business owners thought so too. I thought to myself, “these people need to get a grip.” Growing up in the NYC area this stuff was normal, it was just apart of life. And the crime rate there was definitely a lot higher than here where it’s pretty much non-existent. There’s a reason why I have so many speeding tickets (yes, because of my speeding but also because the police have nothing better to do!). I remember as a child being told that the homeless were harmless and that they ought not be feared. I also remember seeing all of the characters on St. Mark’s Place and being fascinated by them and yet also never being bothered by them, at least not in a threatening manner. Mind you I have these experiences but these experiences also serve to put a wrench in the prevailing notions found in our culture. Forgive me for my pretentiousness. In his documentary/mockumentary in 2002 Michael Moore brought to light what some would call the “culture of fear” found in the good ole’ US of A. 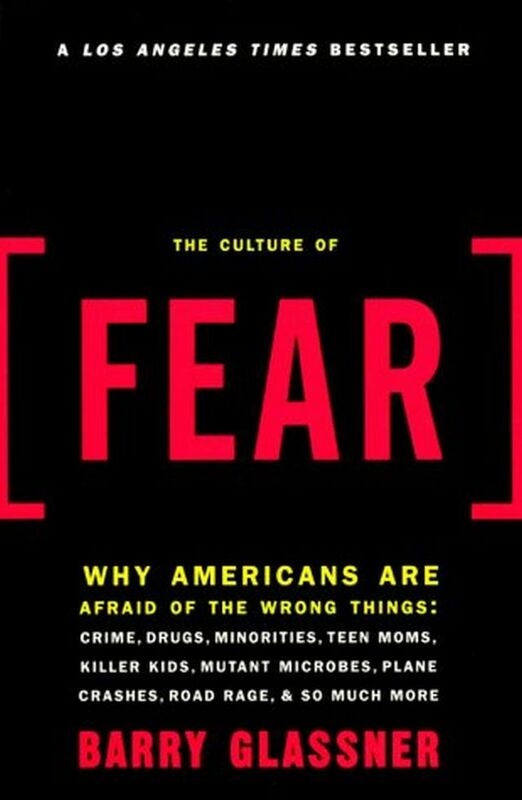 This point in the film was based on a book written by Barry Glassner entitled “The Culture of Fear: Why Americans are Afraid of the Wrong Things” which is an incredibly insightful read. Glassner challenges many of the prevailing ideas that we take for granted like the supposed threat of poisoned halloween candy along with the supposed threats of being assaulted by a random stranger in our households as well as children being abducted and so forth. He exposes that what we have come to fear are things that have no basis in reason and factual evidence. Glassner claims that the media is largely to blame for bringing attention to certain incidences with a general fervor and consistency whilst not relying on facts nor reporting the actual facts. So often people’s objections to certain ideas such as loving our enemies at all costs or letting the homeless be are informed by the culture of fear and ideas and instances that rarely, if ever, happen. When I wrote about loving our enemies one of the objections that I received had to do with a theoretical incident of what to do with the person who comes into my house seeking to steal my child. The question that ought to be asked in relation to such a theoretical incident is “where did such an idea come from?” Needless to say we rarely ask such a question thereby leaving us at the hands of the culture of fear in which certain things are taken for granted such as the need for violence or legislation that minimizes homeless people’s presence or the need for a security alarm system in upper middle class suburbia. We really don’t realize how powerful media and entertainment really are in relation to the formation and continuing legitimization of those presuppositions. It causes me to think of the Apostle Paul’s call to nonconformity in Romans 12 followed by the renewal of our minds through the Holy Spirit. Evil goes so much deeper than we realize and Christ’s death, his grace and forgiveness, his spirit permeates all those areas bringing to light what is false and true. But there’s more here that got me thinking. Since we’re a resort town the main concern of the business owners is the tourists being made to feel uncomfortable by the homeless. But then again, maybe that’s a good thing. I know I know I’m not a business owner but maybe many vacationing Americans need more of a taste of such a picture in a culture and economy that is driven by consumerism, of buying things that we don’t need. After all, many of the homeless are so because they have decided to live outside of what is considered to be normal. Some have rejected the culture of consumerism that has come to embody America whilst others are victims due to alcoholism and addictions that stem from poor family situations or mental disease such as bipolar disorder and schizophrenia. Nonetheless they’re always there whether we see them or not and are part of the human race – that which Christ came to restore. It might do children some good seeing and experiencing such people. It reminds me of the Apostle John’s words, “there is no fear in love, but perfect love casts out fear.” What if we sought to be vulnerable, to love and to not fear no matter the person or situation? We might be surprised by what we learn with certain presuppositions being challenged only to be changed and restored by the Holy Spirit. We might be surprised how the Holy Spirit would conform our minds to the mind of Christ and not that of the world. I think it did me some good when I was a child and I hope it’s continuing to do so as an adult. Great post. I always come back to how do we change such an outlook on life… How can we change such presuppositions that are engrained at such an early age? Definitely things to wrestle with.